Yet no one does anything about it! This scenario can be witnessed in both indoor and outdoor climbing, but specifically in bouldering—where friction plays a fine balance between being your best friend or a lunatic with a prison shank. So instead of continuous punting or watching your buddies flail: be a hero and clean up the problem. Just keep in mind; it’s usually proper ethics to let whoever just brushed the holds climb next. I can practically smell if a hold needs some love from over 100 paces away. Look for a visible sheen from moisture coming either from “ya boy” with sweaty hands, precipitation, or sappage (seepage of groundwater through cracks, fractures, or jointing). Either of these indicators means that you’ve found a hold deserving some attention. When you see a surface in this state—unless everyone has their own particulate mask—please do not physically dump your fine-grained chalk powder everywhere! Use that handy chalk sock you keep in your chalk bag or bouldering bucket (you do carry one right? ), smack some of that chalk on there, and brush the excess off. 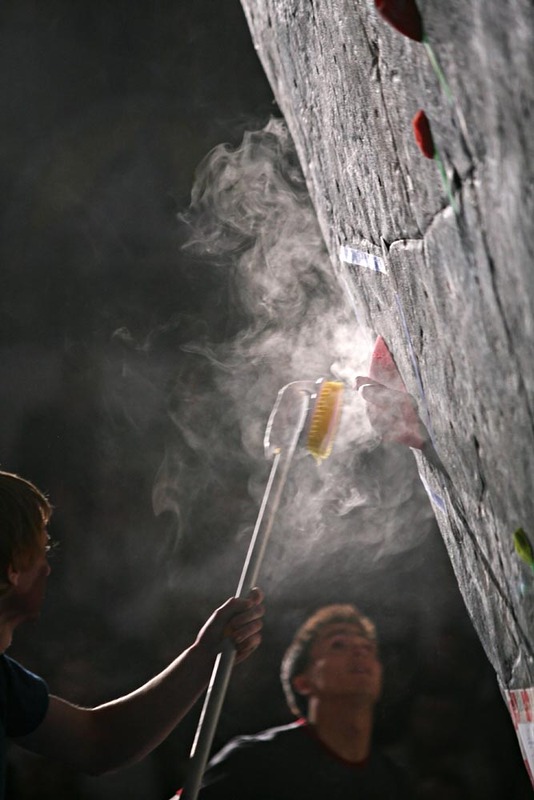 The other terrible extreme: when you encounter a hold caked with chalk. In this case, you’re not really grabbing your hold, but layers upon layers of a sweaty concoction of magnesium carbonate, bodily fluids, and bacteria from “ya boy’s” body. I don’t know what you’re into … but I hope it’s not that. At any rate, you can go ham with your brush in this scenario. Be that hero and clean holds for yourself and your buds. The universe will reward you with many sends and the most loyal of climbing crews. Nylon: ok we can work with that. Steel: NO, GET OUTTA HERE! Metal brushes will destroy softer sedimentary rock and has even been known to make granite V16s become V15s ( … word on the street). There is a time and place for metal brushes; mostly when cleaning new lines outdoors or when lichen, dirt, and biota are covering your rock. But always be gentle. Love your rock. Another thing that should be mentioned is: DO NOT climb wet sedimentary rock. No amount of chalk and brushing will dry it. The popular opinion is that this just applies to sandstone and conglomerate rock, but limestone and dolostone can also be fragile if very porous and wet (not to mention you’ll feel like your trying to hold onto a well-oiled gazelle). These rocks have cement or matrix holding small grains, which become weak when saturated. Welded tuff could also be compromised if saturated for a long time and yarded on. There is a strong possibility holds on these rock types will break off! This article was originally published on March 17, 2015. The Joys of Moderate Multi-Pitch … and How You Can Enjoy It, Too!